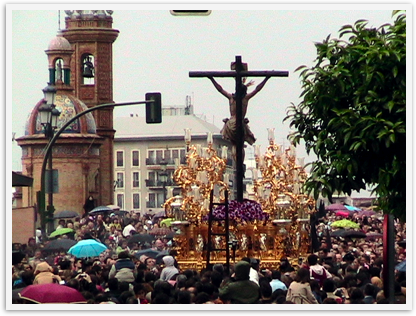 They call it “unforgettable” and people come from around the world to see and experience Holy Week in Seville. There is certainly nothing like it any where else and it is quite fascinating even to a non Catholic. It is one of those things to do at least once in your life, so now we have done it and glad we saw it first hand. We would love to come back and see some more. It is a madhouse and a spectacle with buzzing energy like the World Series, New Year’s Eve in Times Square, Macy’s Thanksgiving day parade or something similar. Between us, we have done those things and other similar things, so knew some of what we were getting into with the insanity of crowds everywhere. Still, Spaniards have their own unique, exotic and wild ways that just can’t be described. There is pomp and circumstance, mystery, tradition, religion, art, high drama, chaos, costumes, mantillas, camaraderie, music and more. Words can not describe it, nor can the pictures or reading about it, you really have to experience it in person. Even watching it live and close up on a big screen TV does not capture seeing it in person. I wonder if any one can understand it fully, unless you have lived here for generations. It is just not like anything else. I know they do this in many parts of Spain and I am glad we caught some of it in our little village. It will be interesting to experience the processions in other places and compare. 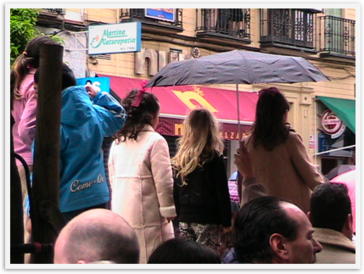 Seville’s are really over the top and the whole city revolves around them for this week. 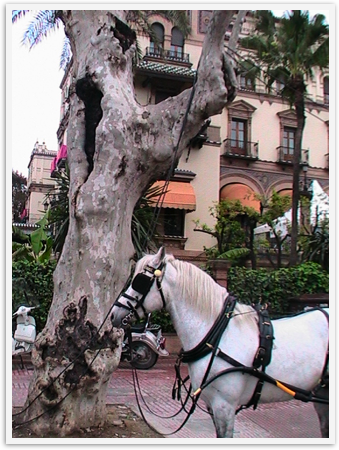 The aristocratic enchantment here in Seville makes a perfect back drop to these celebrations. It is a different city than the one we visited in March (a little too packed with people now for my taste), although still extraordinarily beautiful. Much of it is blocked off for the many processions so it is challenging just to get around. We did manage to get taxi’s though easier than we expected. It would help to know the city better than we know it, but we were fairly lucky. We really only got a taste because the weather has not been very cooperative and some processions have been rained out or too cold for standing about for hours. Plus we needed time to just rest and get situated in our motor home. Our German neighbors here in the campsite came all the way from Germany to see the Madruga and they loved it. We passed on that one because it goes all night and it was a cold night. We considered getting up at three A.M. to catch the key parts at dawn, then said naaa, too much effort with a six year old. Even babies are taken to see these processions and I saw plenty of babies in smoky tapa bars and even one mom nursing a newborn in one between processions. There are quite a few young babies here in tents in our campground to see the show. Nevertheless, we are not that interested in dragging a six year old all over to see every float thru endless crowds in cold, often rainy weather. Once I saw the crowds on the large TV screen here, I was less interested in joining them for too many hours or days. 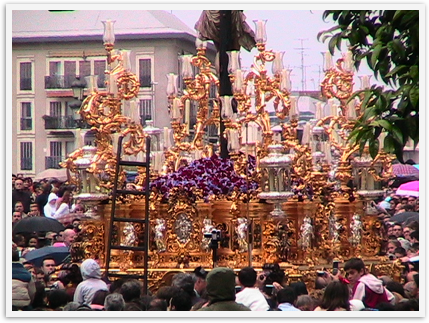 Our favorite one was one called El Cachorro which starts in Triana and goes over a bridge into Seville proper. 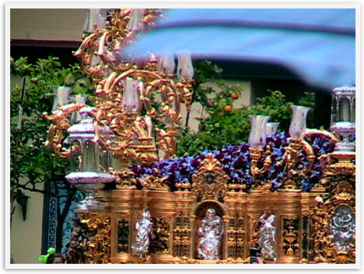 Triana is a very interesting soulful part of Seville that has great Tapa bars. We thought we would get some tapas and then get to this great viewing point on the other side of the bridge that someone had told us about. Like many of the days it started out sunny and lovely, but then the clouds rolled in and rain was a risk, so we bought an umbrella. It was wild and crazy with people rushing to get close and started early so we never got to that perfect viewing point. Perhaps they started early because it started to sprinkle and these are ancient statues so they get cancelled in the rain so as not to ruin the statures. Meanwhile, it is a great honor to be a “Penitent” who carries it with fifty to hundred others and a once in a lifetime possibility, so if it rains one never gets another chance. Some walk barefoot and they practice steps so that they make it “dance” along the way. I have read that grown men cry when they get cancelled because of rain because it is so devastating to them. We did get some yummy tapas and Mozart even enjoyed the calamari one. 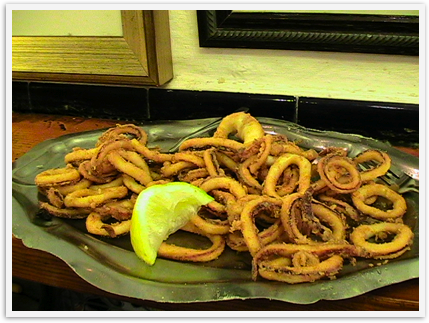 The tapa bars were crowded and messy with dishes scattered about as the staff could not keep up. 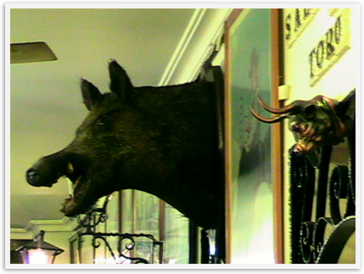 There was a stuffed wild boar’s head in one of the tapa bars that we stopped and ate in. It struck me about how that was such a good image for this wild, earthy, exotic country. There is passion here unlike anywhere else reflected in their celebrations, art, flamenco, bullfights and more. 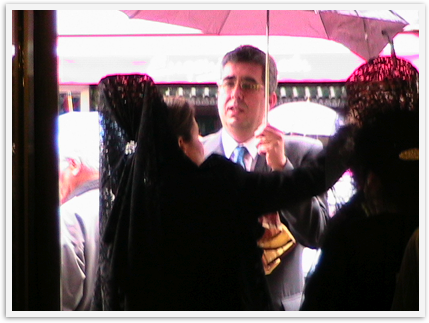 I am not sure if I am ready for Morocco as sometimes Spain is almost too unusual for me and bombards the senses. We later saw a place where parents were putting their kids so they could see, so we hoisted Mozart up. There were mostly locals at this one where we were and they clapped and loved this float (not sure what the correct term is) and band. The music is peculiar to my ears, but one grows fond of it after a week of listening to it. I can not even begin to describe it, but some of it sounds like a funeral march or in that vein with brass sounds and of course always the drums. 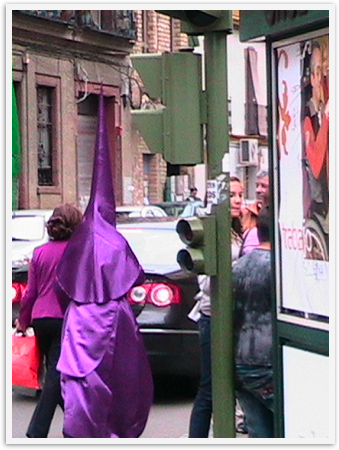 There are also lots of people with KKK type costumes with tall hats that march along. They also have a name that I have forgotten. 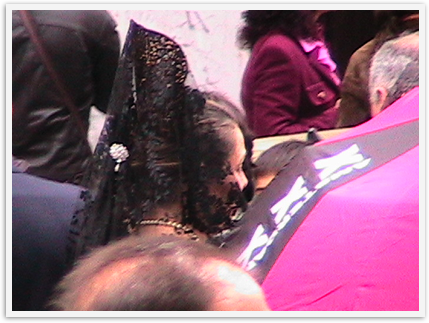 Many people were dressed up, men in suits, women walking and standing in high heels, some kids dressed like priests,penitents, caped costumes or Sunday best. I loved the mantillas because I have not seen them before and have only read about them. One of the sweetest moments for us, was talking to our taxi driver on the way home. 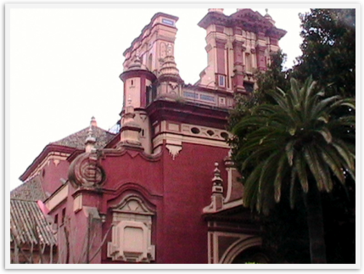 He had lived his whole life in Seville and we even passed by the church where he was baptized as a baby fifty nine years ago. He took a liking to Mozart and gave her a picture of his church’s Madonna. 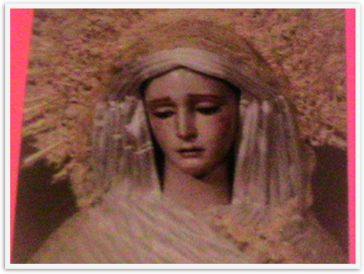 She wondered why she looked so sad and wanted to save it for her teacher Carmen Lucia when she returned to our village. We convinced her to keep it forever. 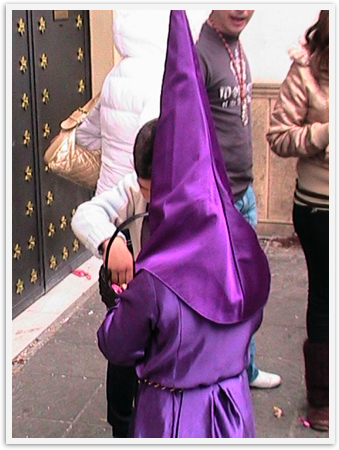 What could be a better souvenir for Semana Santa (Holy Week) in Seville?